At the J Bar L, the untamed beauty of Montana lies just beyond your doorstep. Neighboring the Red Rock Lakes National Wildlife Refuge and the Centennial Sandhills Preserve, and bordered by the Centennial and Gravelly mountains, the Centennial Valley is one of the world's finest locations for wildlife viewing, birding, and fly fishing while still feeling off the beaten path. Ripe for exploring, our fabled valley features some of the most stunning, secret spots that even locals don’t know about. You may have to stray from the road to get to these hidden gems, but believe us when we say it’s worth it. Driving distance from the Yellowstone National Park, world-class fly fishing waters, breathtaking hikes, and more, the J Bar L offers you all the comforts of a secluded home on the range after a long day of play. For more specific activity recommendations for your vacation to the Centennial Valley, please see our Sample Itinerary. Guests at the J Bar L’s Twin Bridges location can enjoy some of the best fly fishing the region has to offer. A mecca for fly fisherman across the country, Twin Bridges sits at the meeting point of the famed Beaverhead, Big Hole, Ruby, and Jefferson rivers. Located just ten minutes south of Twin Bridges, guests at the cabin can spend their days fishing our blue ribbon waters and exploring this quintessential Montana small town. Given the cabin’s year-round availability, Twin Bridges guests also have access to cold season outdoor adventures, such as skiing and ice fishing. Please see the Twin Bridges activity recommendations below for more information. If you're interested in booking guided experiences, our staff will be more than happy to connect you with a number of outdoor professionals in Southwest Montana, including fly fishing, hiking, horseback riding, and birding guides, as well as geologists and a full-service pack-and-guide business. Guests are always provided with recreation and road maps, as well as local hiking guides, on arrival. The J Bar L is a BYOG facility (Bring Your Own Gear). While we do have a limited amount of basic gear for your use, we do not offer kayaks, canoes, bikes, fishing equipment, or the like for rent on-site. 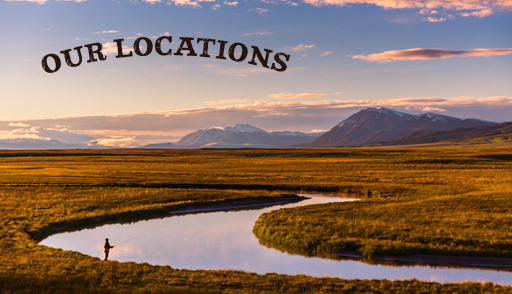 If you book a guided trip, some outfitters may be able to provide you with gear, or you can bring your own to enjoy all the area has to offer. Book your stay at one of our Montana Ranch Vacation Rentals today.